Some of the finest buccaneers around! Ahoy, me hearties! Sid Meier's Pirates! released for the Nintendo Wii on September 28, 2010 with a MSRP of $39.99. The game was developed by 2K China, Firaxis Games, and Virtuous and published by 2K Games. It received an ESRB rating of "Everyone 10+" with "Alcohol Reference, Mild Language, Mild Violence, Suggestive Themes" listed as content for gamers and parents to be aware of. 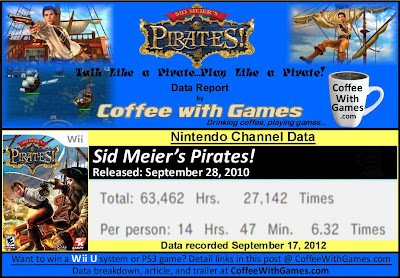 A description for the game reads, "Overflowing with intense pirate action, Sid Meier's Pirates! features a treasure chest of gameplay riches, including the traditional mini games from the classic original such as Sword Fighting, Ship Combat and Dancing, as well as two brand new Wii exclusive mini games Bombardment and Lock Picking. In addition, the Wii version offers exclusive character and ship customization options." 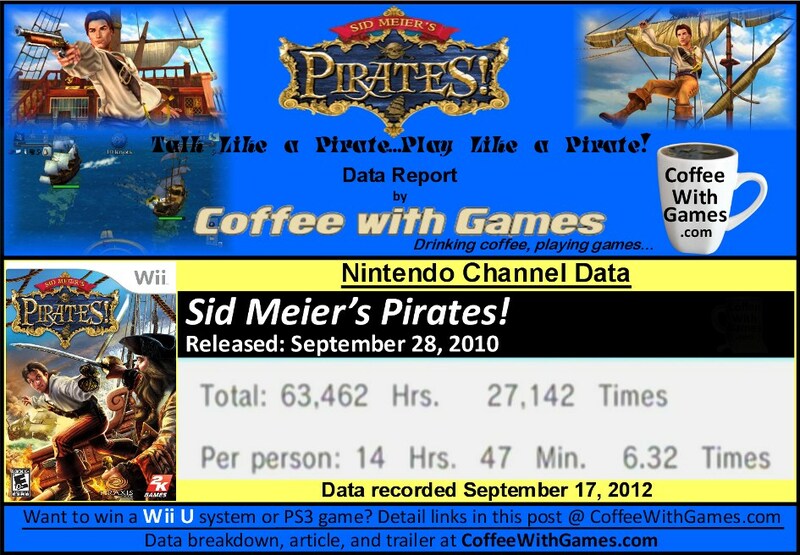 How many hours have U.S. Wii pirates reported pillaging the seas in Sid Meier's Pirates! since the game released almost 2 years ago? Batten down the hatches, brew yourself some coffee, and let's take a look! Sid Meier's Pirates! has approximately 4,294 U.S. Wii owners that have reported being scurvy dogs through the Nintendo Channel, with 720 days possibly reported. The game has 63,462 Total Hours of gameplay reported, with its overall reported average being 14 Hours 47 Minutes "Per person". The average play-time per day/session is about 2 Hours 20 Minutes. How was the game received by "professional" critics (aaaarrrggghhhhh!) and customers? Pirates! has a "professional" review score average of 61.54%, based on 13 reviews on GameRankings.com. It has a customer review score average of 76.66%, based on 18 reviews from Amazon.com. I wasn't sure what to expect for average hours "Per person", but seeing the game sitting near 15 hours "Per person" I think is pretty good, especially considering you can find the game for under $20 on Amazon.com. If your local GameStop store carries it, you should be able to grab it for under $10 there. 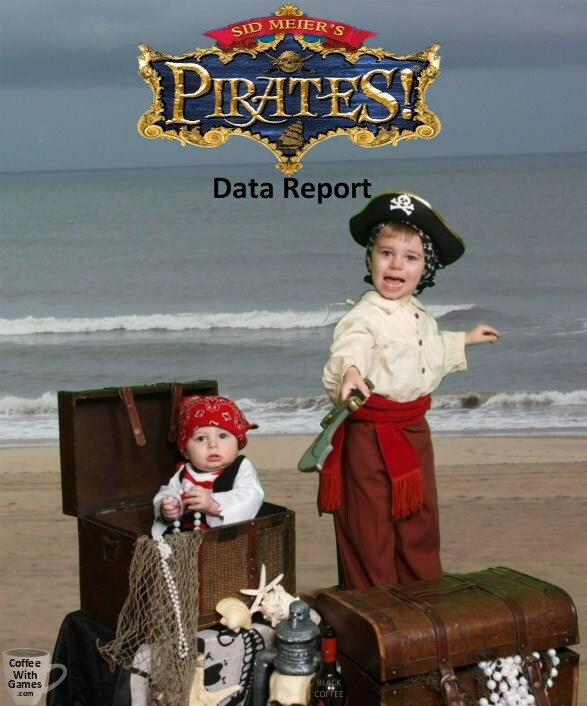 Did ye talk like a pirate yesterday (still my today) for Talk Like a Pirate Day? More importantly did ye play like a pirate, perhaps in Sid Meier's Pirates! or another pirate related video game? If ye played Sid Meier's Pirates! on the Wii, would ye recommend it to Wii owners that are looking for a fun, pirate-themed, video game? If ye had played the older Pirates! games, did ye find the new Bombardment and Lock Picking Wii mini games fun? Or, prefer to stick with the standards? If ye are interested in pirate related games, ye can find some below! I must admit I haven't played it much - I have the iPad version and it seems like fun, but not something I have really got into? Pretty good numbers for a no-budget release! I did see there was an iPad version when researching stuff for the game, but didn't research that particular version any. Thanks for the comment, and did ye talk like a pirate!? Love the topic and timing. Nope, no Pirate Talk, and I haven't played this version of the game - but i had played it on PC years ago and picked it up for my PSP as well. Both were excellent, though I think the charm of the PC version, which was new to me at the time, trumped the PSP version - I didn't enjoy it quite as much the 2nd time.